Born in Kishoreganj, Bangladesh. 1911 Decorated the gates to welcome King George V, on his visit to India. 1919 Founded, Indian Academy of Fine Art, along with Jogeshchandra Seal, Jamini Roy, Bhabani Charan Law and Atul Bose, Calcutta. 1931 Maharaja of Kashmir invited him to live and paint in Kashmir. 1932-38 Court Artist of Maharaja of Patiala. Published the journal, Shilpi, which was co-published by A.C. Mukhopadhyay. 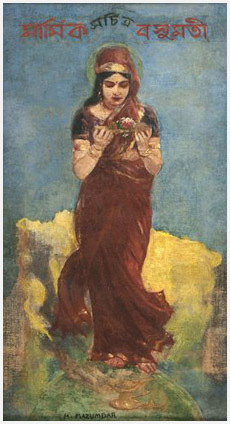 Indian Academy of Fine Art published an album, Indian Masters, where some of his paintings were published. Painted, Cure of all Ills, during his illness, depicting Mahatma Gandhi spinning thread. 1910 Joined Govt. School of Art, Calcutta. 1911-15 Studied at Jubilee Art School, Calcutta. 1921 Bombay Art Exhb., Bombay. 1922 Exhb., Barna Jhankar, Madras. 1923 Exhb., Kardame Kamal, Bombay. 1940 Exhb., Chowringee Terrace, inaugurated by Queen of Coochbehar, Calcutta. 1948 All India Exhb., Calcutta. 1951 Exhb., Eden Garden, Calcutta. Academy of Fine Art, Kolkata. National Gallery Modern Art, New Delhi. 1921, 22 First Prize, Bombay Art Exhb., Bombay.